SUMMARY: The JMU team won the First Place Gold Award and a $600 cash prize for their integrated marketing communications plan for the Humane Society of the United States. 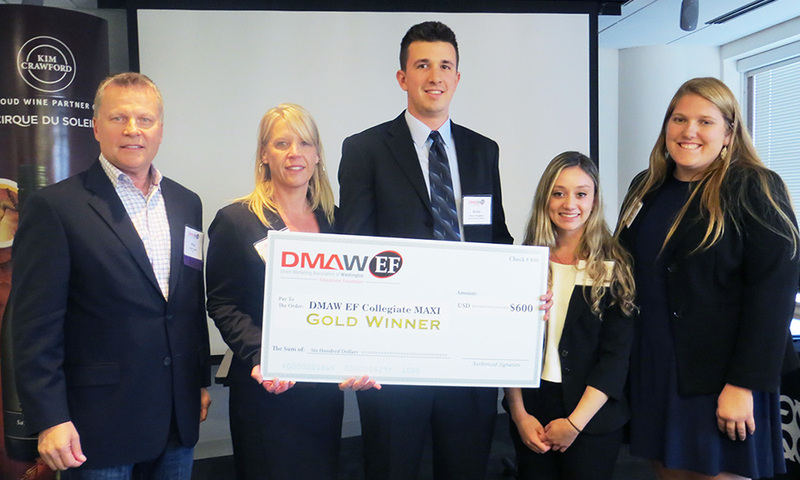 A team of JMU students took top honors in the Fall 2016 Collegiate MAXI Case Competition, sponsored by the Direct Marketing Association of Washington’s Educational Foundation (DMAW/EF). The JMU team won the First Place Gold Award and a $600 cash prize for their integrated marketing communications plan for the Humane Society of the United States. They are donating the cash prize to animal sanctuaries associated with the organization. Coached by marketing professor Theresa B. Clarke, the JMU team of Lynn Radocha (Team Captain), Nicole Carothers, Briana Cifelli, and Bryce Pangman created a multi-channel marketing campaign that included direct mail and e-mail communications, digital advertising, social media and other relevant channels to create awareness of the organization and drive donations from younger markets. Their creative platform was built around measurable goals in regard to the team’s proposed marketing efforts. Radocha and Carothers prepared and delivered the team’s presentation at Quad Graphics in Alexandria, Virginia, to a panel of judges representing the direct and interactive marketing industry. They competed against 11 other teams from five states in the mid-Atlantic region. The students spent many hours outside of their regular classes researching the work of the Humane Society and understanding the organization’s mission and goals while finding a way to effectively reach and engage their target market. Their final pitch included a creative theme, media plan, budget and projected return on investment. To participate in the spring 2017 DMAW/EF Collegiate MAXI, please contact Dr. Clarke at clarketb@jmu.edu.